Professional consulting firm Deloitte is breaking down barriers in its Canadian office. The company’s Montreal branch got a brand new office this past summer, and the new design has almost completely done away with assigned space. The new design offers a number of both public and private workspaces, communal workstations, and social spaces throughout its seven floors to accommodate the wide variety of needs and working styles represented by their employees. We reached out to Matthew Kobylar, a workplace strategist with Arney Fender Katsalidis, to find out more. Deloitte occupies 160,000 square feet of the 514,000 square foot building, over seven floors. Deloitte’s Montreal office has a working population of 1,200 people presently. However, the space is designed around a mobility program which would allow it to accommodate more than that through agility (sharing) ratios. For Deloitte the square foot per person metric, whilst currently at 130 square feet per person, is not a useful metric for understanding their space usage. Rather, Deloitte has focused on achieving a high utilization factor, in order allow staff to work collaboratively together in the Montreal office. About 1,200 employees work at Deloitte in Montreal. The office [was designed] to run at about a 70 percent utilization on a typical day. La tour Deloitte has direct links through the underground network to Lucien L’Allier and Bonaventure Metro stations, and within a short walk of Gare Lucien L’Allier and Gare Centrale, making access for those using mass transit is quick and easy. The principal workstations are Knoll Antenna products, which are provided in three types of workstations: “L”-shape, bench and 120 degree wing. However, only about 40 percent of the furniture is “traditional” desking. In the agile workplace AFK have developed for Deloitte there are over 18 different additional settings that staff can choose to work in. These additional components are from a wide selection of North American and European manufacturers. 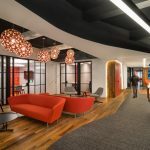 Deloitte’s workplace is designed around an agile workplace concept. Key to this is the ability for staff to work from anywhere. This includes home, client sites, travelling and, when in the office, the ability to work in a variety of work settings that respond to the needs of the user, like spaces to collaborate or getaway and focus. Nearly 90 percent of the space is unassigned. Staff have the ability to sit anywhere in the workplace. Some special “neighborhoods” have been created which are reserved for staff of a particular department for confidentiality or legal/regulatory reasons, such as human resources. Careful time and consideration was brought into creating a workplace that reflects the Deloitte brand and culture. Deloitte is essentially many business units with extremes of personality. On the one side is the tax team, who are quite conservative in dress style and often spend more time working in a focused mode. On the other side of Deloitte’s business spectrum is consulting, with staff who often dress in jeans, smart shoes and spend more time collaborating in the workplace. This is reflected in a recurring theme of facetted surfaces in the design, and in the materiality of the project, which pivots between tailored sophisticated fabrics/details and raw/industrial materials. In this way a physical manifestation of different personalities coming together is represented in the building. The branding is subtle and sophisticated. Brand colors are used sparingly and for dramatic purpose to emphasize a point. For instance, the atrium staircase uses the bright Deloitte green on the floor of the treads. This acts as a metaphor for the literal linking of the Deloitte spaces, which the staircase does so elegantly. Regional cues are picked up in the use of vintage Montreal images incorporated into the graphics and also in the “map” rugs in reception. In this way the space links Deloitte nationally, pays homage to the business units and speaks to the local character. The five-story atrium space is the most unique feature of the space linking the Deloitte floors, driving behaviors that create interaction and well-being, as well as opportunities for spontaneous interaction in a dramatic open celebration of space with a sculptural linking staircase. The atrium references two significant design directives set out early in the project: Deloitte on Display and Linked Landscape. Deloitte is on display as the atrium allows clients and visitors a glimpse into the inner workings of the organization, but also Deloitte is on display to its own people. The Linked Landscape concept was about building connections, somewhat like a tree that vertically travels through a space but also horizontally branches out, linking staff together and helping to build connections. The atrium was purposefully created for Deloitte by removing usable area from each floor. Strategically, different functions have been put on different floors in order to drive movement on the interconnecting stairs. The staircase “lands” at each floor with a differently colored themed tea point, creating a meeting location on each floor. The staircase itself was designed with larger than required landings in order to allow space for people to pause and chat if they happened to meet on the staircase. Deloitte was in their previous office for over 30 years. Whilst some groups were already experiencing some level of desk-sharing, others were still in a 1:1 assignment of space, many with private offices. For some of these people the new agile workplace represented a large change. Deloitte did undertake a change management program that began about two years prior to the move in order to bring people along the journey. The strong relationship built between the design team and the client during this project was inspirational. Through the engagement process the goals and aspirations of the project were captured and succinctly developed into four key design drivers for the project. The time and investment in the development of the workplace strategy, defining these clear objectives and building consensus within the client team of how the workplace could help the business reach their goals and aspirations was a key to this project’s ultimate success.